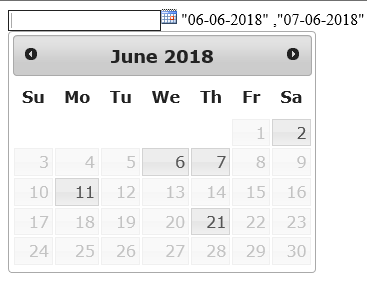 But Date not working which is in label why? when you split it, the result be "8-7-2018" and "5-7-2018"
"06-06-2018" ,"07-06-2018" ,"11-06-2018" ,"20-06-2018" ,"21-06-2018" ,"22-06-2018"
<asp:Label ID="LD" runat="server" Font-Bold="True" Font-Names="Palatino Linotype"
What's problem with my code? Here's tested and working code. Reason why my previous code stopped working because of prefix 0 in dates. Just give me value from database set in Label. font-weight: bold;">"06-06-2018" ,"07-06-2018" ,"11-06-2018" ,"20-06-2018" ,"21-06-2018"
,"22-06-2018" ,"23-06-2018" ,"03-07-2018" ,"18-07-2018" ,"20-07-2018" ,"25-07-2018"
but date is not enabling why..? My code does work, but you still say it does not? Now 2 is not shown and 29 is shown.